I can’t believe that the school year is just about to end. Well, for us in the Boston area, we have school for another three more weeks, but I’m pretty sure for the rest of the country, school is just about wrapping up. I always like to contribute to the class gift, and then I give the teachers something homemade. Not a big deal, but something that’s a little more personal than a gift card. 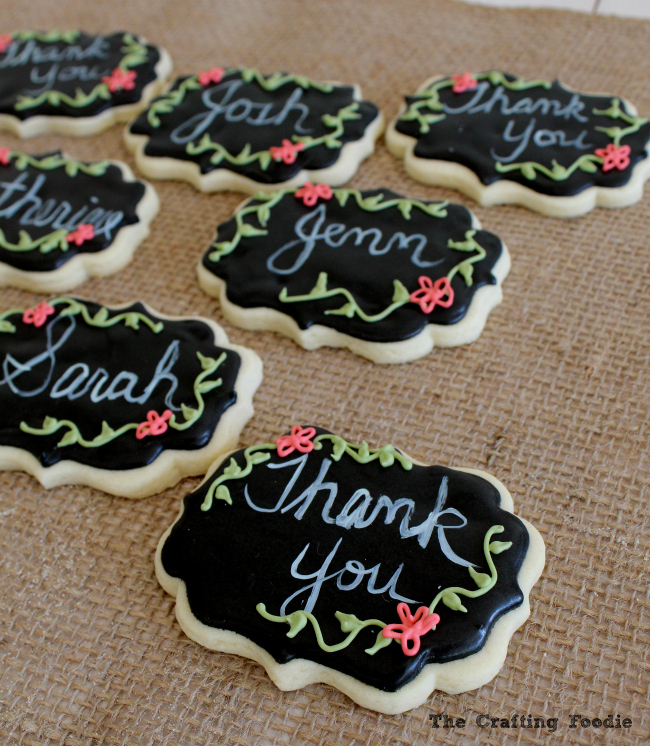 So I came up with these simple Decorated Chalkboard Cookies. 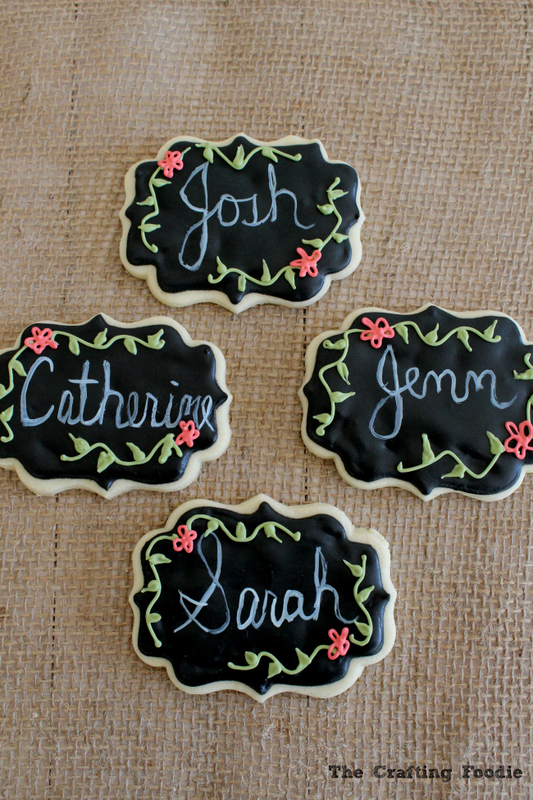 The key to making these Decorated Chalkboard Cookies is the black royal icing. One of the most important factors of coloring royal icing is time. The color of royal icing gets dramatically stronger as it cures. The darker the royal icing, the longer you need it to sit. So, as long as you tint your black royal icing at least 12 to 24 hours before using it, you’re going to be able to make these cookies in a snap. 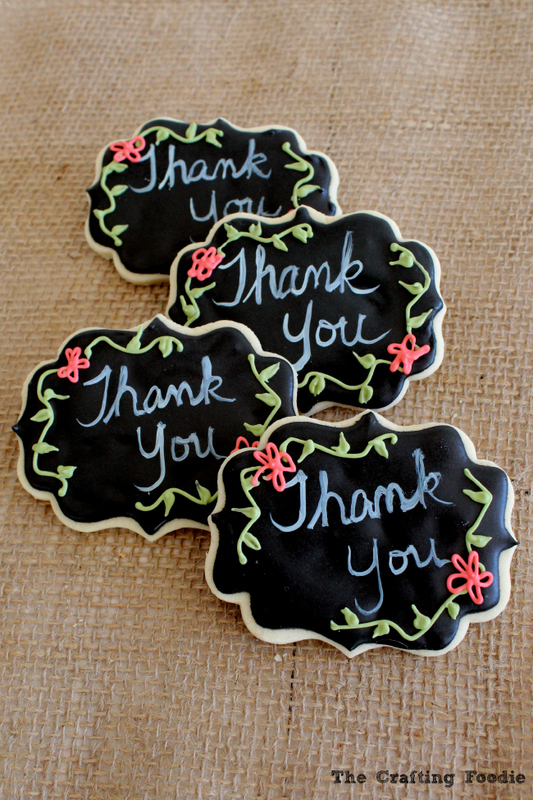 The steps to making these Decorated Chalkboard Cookies is very simple. Outline and fill the cookies with black royal icing. 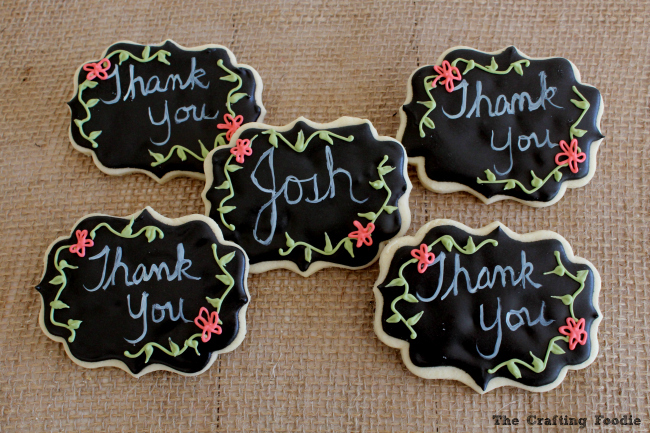 Once the royal icing dries, using a very, very thing paint brush (we’re talking a 000 size brush) that is reserved for food applications, paint on the words “Thank You”. I did it free hand, but you can use a scribe tool to scratch out an outline. For the paint, I simply used some white gel food color. The white color dries very quickly, and once it’s dry, it’s time for the vines, leaves, and flowers. I could have gotten a lot more detailed with the flowers, but I liked the simplicity of the cookie. And as you can see, I personalized the cookies for each teacher. This particular set was for my daughter’s preschool teachers, and at her Montessori, the teachers go by their first names. I know that cookie decorating isn’t for everyone, but if you have ever wanted to try, these Decorated Chalkboard Cookies are a great cookie to try. It’s such a simple, straight forward design with very elegant and pretty results. These personalized, simple, sophisticated cookies are the perfect homemade gifts to thank teachers for all of their hard work. Using 18 second royal icing in a pastry bag fitted with a #2 tip, outline and flood the cookies with black royal icing. Allow the cookies to dry for an hour. 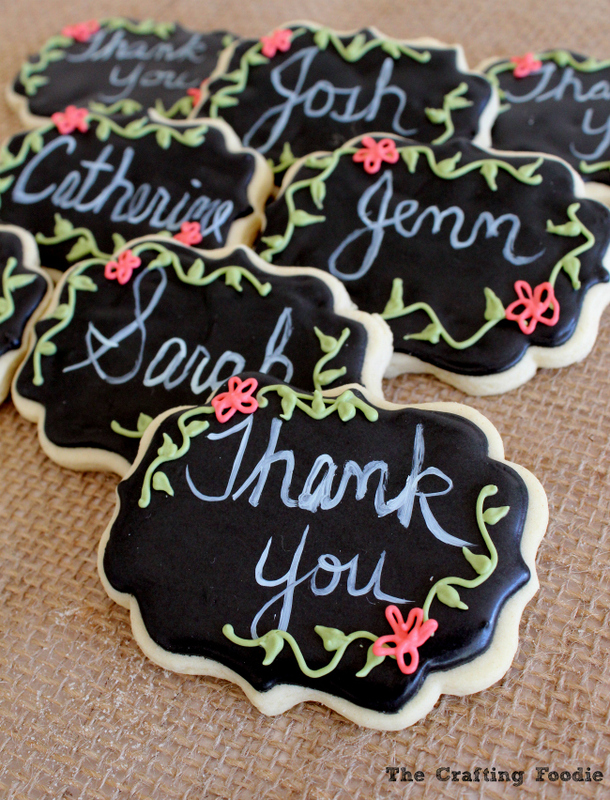 Using a thin paintbrush (used exclusively for food) and white AmeriColor gel food color, paint whatever message you would like on the cookies. Allow the white food color to dry for 20 minutes. Using 20 second icing tinted in Rose and Avocado, pipe the leaves, vines, and flowers. Super cute, Aida! I just baked up a bunch of cookies to practice on. I love this chalkboard look! Definitely want to try it. 🙂 Pinned! Awe! So sweet of you to bake for your daughter’s teacher. I bet you had so much fun baking this. This is such a nice idea to say thank you in a personal way! Quick question…how much sugar should be mixed in the royal icing? The ingredients for the royal icing does not mention sugar, but the instructions for royal icing state to add confectioners’ sugar at once. Cutest cookies ever!!!! These would be great for any occasion really! I can’t get over how insanely adorable these are, LOVE!! Thanks so much, Kelly! They are some of the easiest cookies to make, but they’re still so special!